This is my first time reading a novel by Jami Alden and I have to say that I'm not quite impressed. 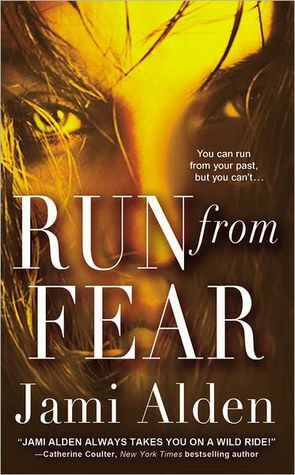 Run From Fear is a romantic suspense novel following Talia Vega and her sister as they run from Talia's dangerous past. But, someone may be trying to scare Talia to repay her for all the trouble she caused in bringing down a crime operation. This is where Jack Brooks comes in. He guards over Talia, even when she doesn't want his help, and forces her to face her fear of the past and future. I experienced the romance in this story, but the suspense and mystery aspect was shattered. There's a small turn in the story that leads to one temporary unknown, but readers know who the culprit is early on. Run From Fear is written in third person perspective and switches between characters, mostly Jack and Talia, but occasionally we're in the mind of the madman. I'm not saying that this format takes away from suspense and mystery in every novel, but there just wasn't enough subterfuge in this story to cause me to second-guess myself. I felt like I was just watching and waiting for the characters to figure out something I already knew. Now comes the action of the story. Talia and her sister eventually become kidnapped, but their rescue was just too easy. I won't give away details, but the scene was only a few pages long. I do appreciate that the last scenes weren't drawn out and boring, but I feel that for all the drama Talia was put through, the ending was slightly anti-climatic.